Excellent service and vehicle (Diesel Dacia Lodgy). Traffic in Turkey drives on the right hand side of the road. Whether you plan to rent a car in TURKEY or drive your own car in Turkey, you should bring driving license, so that you don't need to apply for an international driving permit. The car rental agency in Turkey will want to see it and so will the police if you are stopped. 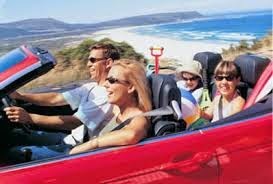 If you are planning to stay long-term in Turkey, then your foreign driving license is usually only valid for up to 90 days. After this time, you must apply for an international driving permit. The minimum age to drive a motorcycle or car in Turkey is 18. In Turkey, if a road accident occurs, the police must be contacted and a report should be made by them. By not doing so, you are breaking the law and possibly punishments may be served. Seat belts must be worn all the time by front seat passages, whether in rural areas or busy areas. Back seat passengers must wear seat belts in rural and less busier areas, where the traffic flows quicker and the speedlimit is higher. Although these are the laws, it is recommended for all passengers to wear a seat belt at all times to be safe. Drinking and driving laws are strict in Turkey and therefore need to be known for anyone planning to drive. There should be no more than 0.05 % of alcohol found in the bloodstream for any driver travelling with a private vehicle. If your vehicle is towing a caravan or trailer, then there is a no tolerance law and if found with alcohol in your blood stream, the consequences will be harsh. The policeare very strict on driving under the influence of alcohol offences and therefore deal severe punishments to those who commit such offences. Your vehicle that you are driving must have motor insurance and if you bring your insured vehicle from another EU country, it is often still valid in Turkey, but it is recommended to check first. Good, reputable insurance companies can be found all over Turkey and oftenfirms and companies dealing with vehicles will often recommend one to you. Headlights must be on in the evening, when visibility is more difficult. Lights should also be switched on in the day time in bad weather conditions, when visibility is unclear. Speeding is one of the main driving offences in Turkey, some drivers choose to ignore the signs and therefore are fined and punished for their actions. Speed limits vary in different areas and on different roads. The average speed limit for cars and other private vehicles is 74mph or 120 km/h on a motorway, 31 mph or 50 km/h in busy areas and 55 mph or 90 km/h in rural and less busier areas. For motorcycles the limit is 49 mph or 80 km/h on motorways, 31 mph or 50 km/h in busy areas and 43 mph or 70 km/h in quieter areas.